It seems that the artificial surface at Providence Park and resting some players are the main reasons Steve McClaren fielded a back four of Bigirimana, Ferguson, Satka and Aarons in that first half, and only Satka is really a regular defender. It’s not surprising that we let in three poor goals in that first half against a Portland Timbers second eleven. It was not a good way to end the US tour and we know results are secondary in pre-season – but this was against an MLS reserve side – so it doesn’t look good. If Steve was trying to unearth a star defender out of some of our youngsters it was a failure, and after our defense was simply hopeless in the second half of the season, there’s going to be a negative reaction to the game from the fans. McClaren has revealed that the Magpies started with Gael Bigirimana, Lubomir Satka, Shane Ferguson, and Rolando Aarons in defense because Fabricio Coloccini, Mike Williamson, Steven Taylor and Jamaal Lascelles could not play on the surface. “We had six of seven who couldn’t play on this surface, and quite a few played who we only wanted to have a small amount of time on the pitch because of troubles they get,” said McClaren. But why couldn’t we have given Jamaal Lascelles and Mike Williamson 45 minutes each – our next game is not until Sunday? And Janmaat could have played a half at the back too – he’s proved he’s more than a decent center-back. That starting defense was simply weird. But we suppose it’s only a pre-season game, and we had our best five center-backs unavailable for this game, with Curtis Good injured again. So that explains why we conceded four poor goals, but it does remind us of last season’s woes in defense, and the fact our defense has been sub-standard for three seasons now. Maybe we can sign two top center-backs in the next week? Do not know much about Kemen, but Midfield is not the issue. Think we have the strongest midfield since Bobby days now. Maybe could do with a natural right winger but I think that is Sissokos best position as he is too lazy for centre midfield. That said, a young natural winger for back up would not hurt. Obertan has had enough chances, and just when you think he has turned a corner he flops to mediocrity or gets injured long term. That said any significant run under Pardew always seemed to have Obertan in the team. He was brought in last season as an act of desperation and we went on the winning streak, and the year we finished 5th he was our main right winger until Christmas when our defence required more protection but the run that season happened before the Christmas period. I don’t think his explanations are unconvincing. I don’t know enough of Lascelles injury history to comment on his fragility on a surface like this, but certainly Saylor shouldn’t be playing. Colo the same. Willo maybe, but why risk him. I think the question that should be asked is why we are arranging a friendly against a reserve side on a surface like this. That is not a question for McClaren though, it is for whoever organised and sanctioned this tour. Does that mean Satka is not a centre back? I always thought he was, but I have seen him fill right back. Is that his natural position? If so maybe he will be our cover this year. My understanding was that his Congo was not in the top 50? Dummett actually gets up and down pitch nicely. Has pace. Can actually cross the ball. Hes left footed naturally. So I think he is a prospect to fill the left back role nicely. His aerial dominance on the wings also comes into contention as a positive. When I have seen him in the Centre he seems to lose out on key battles, normally in strength. I do not think he will cut it as a Centre back in the long run, a makeshift centre back no problem when needed, but naturally I do not think he will be or is what we need in our heart of defence. I agree with you we need a new Cb after Mbemba but I know the club will not buy unless we sell. Next season we can bring in 2 new candidates when Williamson and Coloccini leave. Right back however we need cover for this season, that is why for me after signing Mbemba that should be priority. Coloccini has already touted from Mclaren he will be Captain next year, which suggests him and Mbemba will be in the heart of defence. Taylor is not a bad back up, he just needs to stay fit so he is available when needed. Lascelles we will see, but his signing never filled me with confidence, I just see a younger Williamson but that maybe harsh given his age, and he has not exactly had the game time to prove otherwise. Let’s not get carried away re Obertan. He has been our worst player, time and time again. Often, it was like playing with 10 men. BUT: This game was like a victory to me. I saw him dribble past a player. Let me write this again. He dribbled past a player!!!! Someone find the minute he did that and save that clip. Priceless. Still, credit where due: congrats Obertan, you impressed me. This particular trip to the US was really inconceived. It is out of the way now. you have to have doubts about whoever organised it -viz the playing surfaces and having a far off tour when the club is in a state of rebuilding. Wally must be pleased it is done with now. Back to base should allow for better progress is assessing further what needs to be done and perhaps wield the axe to one or two. We are still short of quality and need 2-3 more in this window. Let’s not forget that other teams have strengthened. I have no doubt that our injury prone players will not disappoint in the coming weeks and we’ll be left short again. Still worried about de Jongs’ fitness/speed but all will be revealed in the next 3 weeks. Jail and I weren’t being negative about McClaren. I did mention I thought he has got selections wrong on this tour, and I will stand by that. He has come out and explained last nights selection, which I accept to a point, but then questions have to be asked of the tour organisers. Jail and I were discussing specific cover, Jail feels we need a right back in, I agree, but think that Mbemba is likely to be used as cover there with other areas taking precedence. Jail created a scenario, which isn’t outside the realms of possibility, to re-enforce his point. Whilst I think we need a right back, I would also like to see a natural leader and organiser brought in at centre half. An organiser can improve the level of the rest of the back 4 automatically. I feel that is where our money would be best spent next. Jail thinks right back. We aren’t getting on McClaren’s back, and I am happy to give him a chance. I think he is one of the best training ground coaches that has managerial experience in England. I worry about his ability under pressure, but that is about it. Congo are 47th, the country Mbemba plays for DR Congo are 60th. I agree midfield is the position we are best stocked in, that is why I would loan Kemen out for experience now. I only brought him up because Rotonda thought he should be brought into the first team picture. He may be right, I haven’t seen that much of Kemen, so I was keen to hear Rotonda’s thoughts on why and where he fits in. Only read what someone wrote, I thought it was Ed saying they were 49th, have not looked myself. If that is not the case then maybe a permit will be an issue. Cheslea have the best defence in the PL yet still play with 2 holding midfielders infront of it. Not because it allows them to attack better, but it adds protection to the back 4. Do you actually understand the way modern football is played? Every decent team plays with atleast 1 holding midfielder, sometimes 2, this is to protect the back four. In the season “we required more protection” in December Colo and Taylor got injured/banned in the same match. Simpson and Williamson were playing centre back the following game! Was actually the second best defense in the PL! The performance against Timber was lacklustre and sloppy. Im concerned that we give the ball away alot and seem very lightweight all over the field. As bad as our CBs are i think we would of won the game if we had played a stronger defence,having said that the sooner we get 2 new CBs in the better. The Mbemba deal is apparently a cert to go thru,i just hope we get another to go alongside him. I think Ed did put that but pretty sure he was mistaken as to which Congo Mbemba played for. Don’t start already ed, jeez. Who cares we lost, I seem to remember a thumping off Lleyton orient pre season and we went on to smash the league. Maybe you’re a bit too close to it over in the states. The point re organising it on a artificial surface, or even going over there in the first place is more relevant though. Big of you to apologise there, the insult seemed unwarranted. Disagree yes, insult why? Colback and a confident Tiote can protect the back line – SDJ, Aarons/Sisoko and Gini behind Mitro!!! It seems they should never had booked a pre-season playing on artificial surface…knowing what they know. There’s no point in playing a game like that…it doesn’t mount to anything constructive. Aimed at me? I’m not sure I gave an insult, I merely said it wasn’t really appropriate II may have used the word insensitive, would have to check back) to bring up plane crashes given events. Still don’t. Didn’t think that plane crashes had any relevance to the discussion Jail and I were having. Wijnaldums best place is that of a centre midfield player. If he placed out wide you will end up doing what Pardew did to Sissoko and wreck his game. Sissoko is more suited to the right now having played and adapting though it totally messed his centre midfield play up. De Jong is born to run the centre midfield behind the main striker. I think the only question or role open for choice is Tiote, Anita or Colback to place alongside Wijnaldum. Pawl…I believe the reason why Chelsea plays with two defensive midfielders is because their wide men are on the offense. It’s to balance it out and because Chelsea is set up defensively. We are not a Chelsea kind of football team. We are probably a cheap version of Swansea and Arsenal. I thiunk we can take it that we wont be playing second rate US teams in pre season in future. I would imagine Steve is pretty peeved but biting his lip. Colo and Mbemba worry me at centre half. 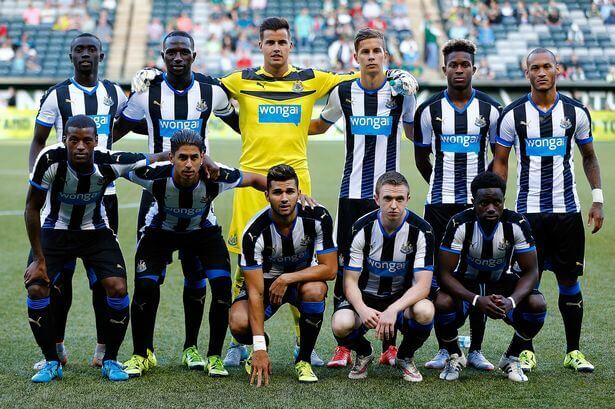 I dont know what Mbemba’s organisational skills are like ( can anyone comment ? ) but I dont trust the height issue. As Bee has been saying though, steve will know this. I think Taylor is going to have his best season in ages for us if he keeps fit. Cyprus, to be honest, the plane crash thing i mentioned was me trying to show how negative you can be. The previous crash was nowhere in my head when i did, so i wasn’t deliberately being insensitive – it never crossed my mind to be honest, which is why i reacted how i did. Lil and myself have kissed and made up now. Both apologised and accepted it. I appreciate your support however, but we were both out of order and best let sleeping dogs lie. To be honest, I’m not sure why we travelled to the States in the first place, but if we are to go to all that trouble at least we could arrange games on grass pitches!! Ed, I can’t agree with your point re selection. I think SM’s decision shows the kind of professionalism that we lacked during the Pardew era. Imagine what we would all be saying if he had played a regular back four just to try and win a pre-season friendly and they’d been injured 2 weeks before the season opener! As I see it, it was a good call on his part, although a bit of a waste of time as pre-season warm-ups go. Munster, from what i hear from Belgian reporters who’ve been following our transfers there, Mbemba is the best defender in the country right now and will make more of an impact than even Mitrovic, which sounds really promising. He described him as a centre back, but sky news has just called him a right back, which kinda confuses the issue. (I’m pretty sure he is a CB though). It’s a done deal – permit assuming to be fine. Hey look ibiza, no sarcasm, more money being spent. Id like to share your optimism about Taytor but the chances of him staying fit are slim to say the least. And what makes you think he will have his best season?,tho i hope you are right. Munster Mag is quite right. You cannot play Colo and Mbemba together as the centre backs. They are just going to give away too much height. This is 2015. Every team in the PL has one or two big forwards, and a couple of big defenders to come up for set-pieces. Maybe Mbemba has a good spring, but if he’s giving away 3 or 4 inches he’s going to be found out at some point in every match. Pawl’s suggested midfield looks incredibly strong. Do you think we can get away with not regularly using Colback and Anita. I rate them both. Maybe if Sissoko is off (in body as well as head), Wij-Aye-Man can move forward, and Jack slot alongside Tiote? Why all this talk about midfield. What about some defence suggestions and ideas fellas? We loose to set pieces and corners. Goalie is inexperience but this is a good exercise. Some qualities shown through. Excited with Aaron’s top quality performance. Why is it that so many people are failing to understand that McClaren is giving literally every player a clean slate?! Krul has hardly featured in the states because he’s clearly the number 1 and McClaren wants to suss out his number 2 goalkeeper and see what level Woodmans actually at. That was the aim clearly in last nights game. When was the last time Bigirimana had game time? Kemen is potentially a squad player for the season coming so he’ll have wanted to have a look at him. The same goes for the all of the fringe players who featured last night. This is what pre seasons about!! When we play Monchengladbach in just over a week have a look at the teamsheet and compare it to last nights. There’ll be 3 players who started last night on it. Everybody just need to chill out ??? ?